I’m really pleased that Peter Elliott, one of the most respected writers on the scene, seems really to have gone for the new album. This is the first review to be published and it is very, very positive. “an utterly modern message from an utterly modern bluesman. Eddie has smartly kept this all in the family, with his son Joe Garcia carrying out an impeccable recording production and his wife, the talented artist Nicky Knowles conjuring a stunning album cover. This is one of the best uncluttered blues albums I have heard for a long time. The band is absolutely made to measure with Zak Ranyard and Tom Gylkes being exactly there close up on Eddie when they are needed and totally unobtrusive when he needs air and space. The album manages to be both traditional and modern without compromising either in any way. It perfectly showcases all Eddie’s proven talent in a ten-track package and on each track he offers something fresh and original. Class. 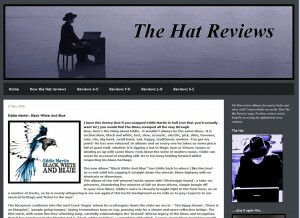 Click to see the full review at The Man In The Hat reviews.